Not sick? No symptoms? No disease? 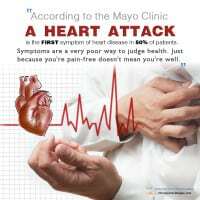 How do you know if you have it (health)? When I ask how you know if you are healthy, I usually hear that “you feel good”. But, can you feel heart disease? Cancer? Diabetes? NO, not usually until it is too late. Health is something that each and every one of us is looking for but we’re not even sure how to spot it. This is a serious issue because health is not merely the absence of signs and symptoms of disease, but rather a state in which every cell, tissue and organ are in 100% communication with your brain 100% of the time. Any interference to this complicated and delicate communication network can and will cause your body to malfunction…but you would not even know it. Thousands and thousands of signals are being sent every moment…every fraction of a moment, through your nervous system. Science states that with the weight of a dime on a nerve you could lose up to 60 % of communication without ever having any symptoms at all. Can you be healthy when your nervous system is compromised to this degree? The world around us teaches us that when you feel good you must be healthy. That is not totally true. 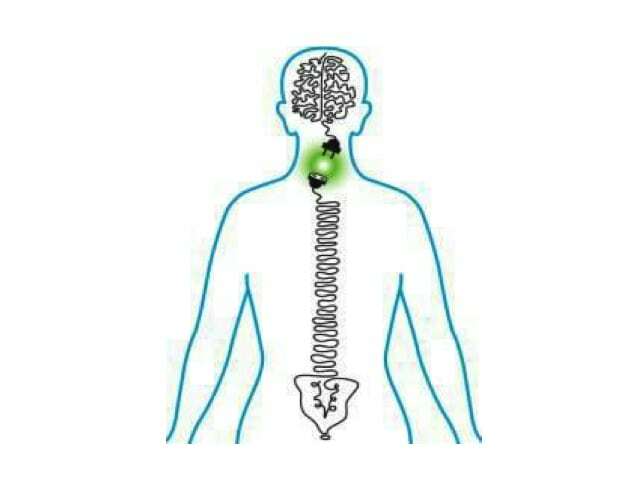 Your body uses signals to alert you when there is a problem. Pain is one such warning and always has a purpose. We are taught to take a pill or drink a potion of some sort in order to feel better, but this is like yanking the battery out of the smoke alarm when it’s going off rather than looking for and putting out the fire. So, we learn that when the alarm (pain) stops the problem must be gone, but the fire might be still smoldering, hidden under the cover of the pain meds. The pills make you feel better by masking the pain signals but they do little to create health within your body. Just listen to end of EVERY drug ad. They ALL (by law) must mention this massive list of side effects. Doesn’t that scare you even just a little? Don’t they all sound very bad? Why don’t they call them bad effects? The side effects, even when they are not felt immediately are pushing your body and cells away from health…but you might still feel good. True health is an inside job and only your body can create it. Do you know how powerful your body is? It all started with just one cell! That one cell contained all the information about you. That one cell with all its DNA dictated your eye color, hair color, how you would look (like your mom and dad). As you started to form into a fetus, the neural tube (spinal cord) formed first, then directed the growth and development of all your organs, tissues and cells, and constantly communicates with them (all 50,000,000,000,000 cells) to this day. Did you know that there are roughly 200,000 reactions that happen inside each and every cell in your body simultaneously every moment of every day? Did you also know that some 300,000,000 cells are dying and growing every minute of every day for your entire life. Some reports state every cell has been replaced at least once every year, some multiple times. With that understanding, I would deduct that our body gets rejuvenated on a daily and yearly basis. Does it feel like that to you? Does your body function like it’s renewed and mended? If our body rebuilds itself every year then how can someone have a sickness or disease? Great question. It all comes back to communication. In order for your body to have perfect cell turnover and rejuvenation, there must be no interference in the communication with the director (brain) and the cell itself. Think of an assembly line running non-stop 24/7 and 365. In order for that assembly line to churn out perfect product, it would need proper maintenance on the structure so it doesn’t break down, it would need fuel and the right kind of fuel to keep running, and it would need rest. The body is always perfect. It is perfectly responding to interference or perfectly responding to the power that made your body. The disease did not just show up this morning. It has been adapting to everything that you have been doing to it every day. Do you feed your body the right fuel? Do you give it enough lubrication (water)? Do you rest? Do you fix things when they break down? Do you do proper maintenance to prevent break down? You make choices every day that influence how your body will perform its minute to minute internal tasks. What you eat and drink. How you exercise and rest. How you breathe. And maybe, most importantly what you think. When your body has the opportunity to restore proper communication and your choices are impeccable and your internal program is strong, healthy, and vital and alive, then you can achieve new levels of health. Chiropractic adjustments are just one way to fix AND MAINTAIN your body’s communication with your brain. Chiropractic adjustments uniquely restores muscle flexibility, joint motion and most profoundly, nervous system integration to the entire body, helping the body to heal and function better from head to toe and from the inside – out. 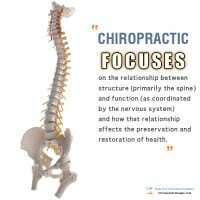 While chiropractors adjust the spine to access the nervous system, we aren’t simply back doctors. Chiropractors help their practice members live better lives by encouraging good nutrition and adequate water consumption, advising about needed supplements, teaching proper stretching and foundational exercises and, of course, by correcting subluxations of your spine that can interfere with communication to and from the brain. Did you know that people under regular chiropractic maintenance care visit their MD less often, have fewer and shorter hospital stays, take fewer medications and report a happier and healthier outlook on life than those who do not get adjusted by a chiropractor regularly? ?